All Time Low just kicked off their special UK tour, playing two special sets every night: So Wrong, It's Right in-full first, with a full All Time Low show on top of that. 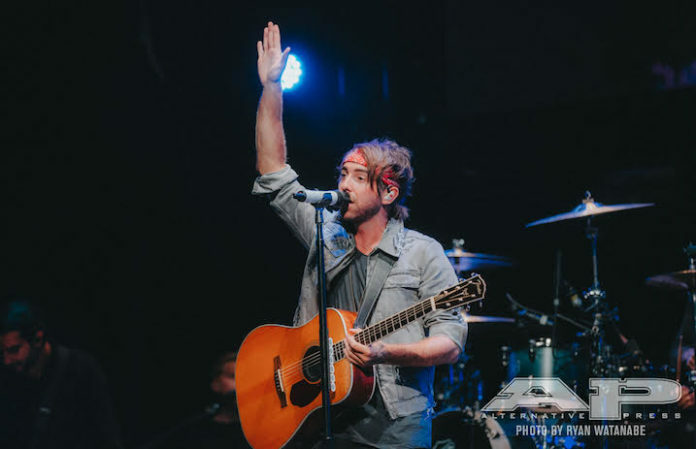 The band kicked off their tour in Glasgow last night, and Gaskarth had heartwarming words to say about playing their debut album to so many people. “There’s something very cool about playing SWIR in these big rooms in front of all of you. It was a record written for basements and club shows. Never knew it’d get here,” Gaskarth shares. Music is cool. We couldn't agree more, Alex. Glasgow, thanks so much for kicking the tour off with us. There’s something very cool about playing SWIR in these big rooms in front of all of you. It was a record written for basements and club shows. Never knew it’d get here. The band are currently on their epic tour in the UK, where they're supported by Creeper. Not to mention, the band brought out State Champs' Derek DiScanio for “Dear Maria, Count Me In” at one of their U.S. SWIR shows, so we'll have to see if they have any special guests in the UK, too… You know we'll be keeping an eye out. Following this tour, the band will be heading out on a U.S. tour this spring in support of 2017's Last Young Renegade. Check out their full list of U.S. cities and dates below!